is an energy psychology technique that utilizes the emotional aspect of the energy meridians in the body to heal emotional issues such as trauma, Post Traumatic Stress Disorder (PTSD), phobias, grief, anger, guilt, anxiety, sadness, etc. It utilizes the same energy meridians used in traditional acupuncture but without the invasiveness of needles. It frequently provides relief where other techniques fail and has a high success rate of 80% or better. EFT states that the cause of all negative emotions is a disruption in the body’s energy system. 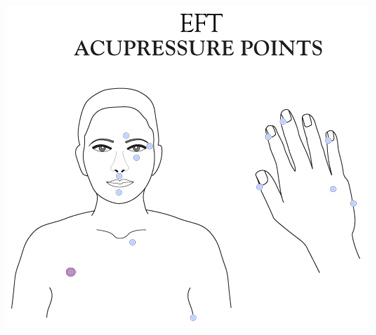 EFT relieves symptoms by using a systematic routine by tapping with the fingertips specific parts of the body. This tapping balances the energy meridians that become disrupted when the client thinks about or becomes involved in an emotionally disturbing circumstance. Once balanced, the client no loner gets upset about the circumstance; the actual memory stays but the emotional charge is gone. Most of the time results are lasting and cognition often changes in a healthy direction as a natural consequence of the healing. 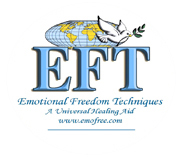 EFT is very easy to learn, and will help remove negative emotions, reduce food and tobacco cravings, reduce or eliminate pain, and implement positive goals. One of EFT’s most useful features is its versatility in working with other healing procedures. Combining EFT with other kinds of healing often enhances the results of the other procedure. Emotional Freedom Technique is a profound healing technique that works extremely well alongside hypnosis. As a practitioner in EFT I have used it consistently and successfully in my Hypnosis and Reiki practice. EFT involves identifying the core emotional issue of a problem like hypnosis. During hypnosis the client has access to a storehouse of information in their subconscious mind, thus easily identifying core issues for healing. When in state of hypnosis, tapping on the specific acupoints allows for the intensity of the emotion or core issue to be much more rapidly eliminated and neutralized, thus allowing the client to use their own intuition and inner guidance for healing. Sometimes a problem, even if very long standing, can be resolved with one session. At other times persistence is necessary such as with chronic problems or addictions. In addition to enhancing the healing process of my clients, I have found that EFT helps them strengthen their positive qualities and confidence. By attaining emotional freedom, they return to a natural state of balance and strength. As a hypnotist, Reiki master, Quantum-Touch and EFT practitioner I act as the guide that leads the client to a place where he/she can find their own answers. I have practiced EFT combined with hypnosis, Reiki, and Quantum-Touch and I have found it works well at all levels, physical, emotional, mental and spiritual. It’s easy to learn and use, as well as an excellent addition to use at home. I teach EFT to all my clients so they can help themselves attain quicker results. Extensive application of EFT has shown impressive improvements in a wide variety of issues, including those listed below. Personal Performance: Abundance, Weight Loss, Business and Career Goals.